With vehicle details so we can help ensure this part fits your vehicle - we aim to respond within 2 working hours. Same day dispatch if ordered before 3:30pm! 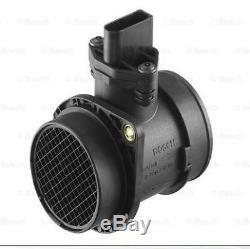 Air Mass Sensor 0986280217 Bosch. 0 280 218 064, 0 280 218 063, 0 986 280 217. 06A 906 461 L 06A906461L. 06A 906 461 L 06A 906 461 LX 06A906461L 06A906461LX. AUDI A3 (8L1) 1.8 T. Engine Code: ARY; Model year from: 09/2000; Model year to: 06/2001. Also fits:- ;Engine Code: AUQ; Model year from: 09/2000. Engine Code: AUM; Model year from: 09/2000. AUDI A3 (8L1) 1.8 T quattro. Engine Code: ARX; Model year from: 10/1999. Engine Code: ARY; Model year from: 09/2000. AUDI A4 (8D2, B5) 1.8 T. Engine Code: AWT; Model year from: 06/2000; Model year to: 10/2000. AUDI A4 (8D2, B5) 1.8 T quattro. AUDI A4 (8E2, B6) 1.8 T. AUDI A4 (8E2, B6) 1.8 T quattro. AUDI A4 (8EC, B7) 1.8 T. AUDI A4 (8EC, B7) 1.8 T quattro. AUDI A4 Avant (8D5, B5) 1.8 T. Engine Code: AWT; Model year from: 06/2000. AUDI A4 Avant (8D5, B5) 1.8 T quattro. AUDI A4 Avant (8E5, B6) 1.8 T.
AUDI A4 Avant (8E5, B6) 1.8 T quattro. AUDI A4 Avant (8ED, B7) 1.8 T. AUDI A4 Avant (8ED, B7) 1.8 T quattro. AUDI A4 Convertible (8H7, B6, 8HE, B7) 1.8 T.
AUDI A4 Convertible (8H7, B6, 8HE, B7) 1.8 T quattro. AUDI A6 (4B2, C5) 1.8 T. Engine Code: AWT; Model year from: 05/2000; Model year to: 06/2001; Chassis no. AUDI A6 (4B2, C5) 1.8 T quattro. AUDI A6 Avant (4B5, C5) 1.8 T. AUDI A6 Avant (4B5, C5) 1.8 T quattro. AUDI TT (8N3) 1.8 T. Engine Code: AUQ; Model year from: 09/2000. AUDI TT (8N3) 1.8 T quattro. Engine Code: ARY; Engine Code: AUQ; Model year from: 09/2000. AUDI TT Roadster (8N9) 1.8 T. Engine Code: AUQ; Model year from: 08/2000. AUDI TT Roadster (8N9) 1.8 T quattro. Engine Code: ARY; Model year from: 09/2000; Model year to: 05/2005. SEAT EXEO (3R2) 1.8 T. SEAT EXEO ST (3R5) 1.8 T.
SEAT IBIZA Mk III (6L1) 1.8 T Cupra R. SEAT IBIZA Mk III (6L1) 1.8 T FR. SEAT LEON (1M1) 1.8 20V T. Engine Code: APP; Model year from: 08/2000; Model year to: 12/2000; Chassis no. Also fits:- ;Engine Code: AUQ; Model year from: 09/2000; Model year to: 04/2004. SEAT LEON (1M1) 1.8 20V T 4. Engine Code: ARY; Model year from: 09/2000; Model year to: 04/2004. SEAT TOLEDO Mk II (1M2) 1.8 20VT. SKODA OCTAVIA I (1U2) 1.8 T. Engine Code: ARX; Engine Code: AUM; Model year from: 08/2000. SKODA OCTAVIA I (1U2) 1.8 T 4x4. Engine Code: ARX; Engine Code: AUM. SKODA OCTAVIA I (1U2) RS 1.8 T.
SKODA OCTAVIA I Combi (1U5) 1.8 T. SKODA OCTAVIA I Combi (1U5) 1.8 T 4x4. SKODA OCTAVIA I Combi (1U5) RS 1.8 T. VW BORA (1J2) 1.8 T.
Engine Code: AUM; Engine Code: BAE; Model year from: 09/2000. Engine Code: AUQ; Model year to: 05/2003. VW BORA Estate (1J6) 1.8 T.
VW GOLF Mk IV (1J1) 1.8 T. Engine Code: AUM; Model year from: 09/2000; Model year to: 05/2003. VW GOLF Mk IV (1J1) 1.8 T GTI. VW GOLF Mk IV Estate (1J5) 1.8 T. VW NEW BEETLE (9C1, 1C1) 1.8 T.
Engine Code: AWU; Engine Code: AWV; Model year from: 06/2000. VW NEW BEETLE Convertible (1Y7) 1.8 T. Engine Code: AWU; Engine Code: AWV. VW PASSAT (3B3) 1.8 T 20V. Engine Code: AWT; Model year to: 06/2001; Chassis no. VW PASSAT Estate (3B6) 1.8 T 20V. Model year to: 06/2001; Chassis no. VW POLO (9N_) 1.8 GTI. VW POLO (9N_) 1.8 GTi Cup Edition. Bosch's portfolio of products is steeped in OE quality and provides one of the most comprehensive ranges of OE aftermarket parts, Bosch's continual investment in research and development allows it to be the worlds largest supplier of cutting edge automotive technology. The item "Air Mass Sensor 0986280217 Bosch Flow Meter 06A906461L 06A906461LX BXHFM547" is in sale since Thursday, May 25, 2017. This item is in the category "Vehicle Parts & Accessories\Car Parts\Air Intake & Fuel Delivery\Air Intake & Fuel Sensors". The seller is "carpartsinmotion" and is located in Leeds, United Kingdom.